At Northwest Medical Rehabilitation we create your plan of care and refer you to the clinicians you need to assist you in your recovery. This team may include speech therapists, occupational therapists, neurologists, psychiatrists, psychologists, orthopedic surgeons, urologists, physical therapists and many more. 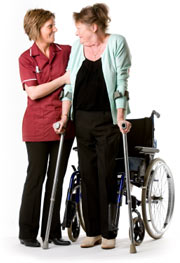 We understand the stress that is created from an injury and the process of returning you to your premorbid lifestyle. We create treatment goals and serve as the leader of your team to help navigate you through the challenges ahead. NWMR provides rehabilitation management for patients requiring intrathecal pumps for spasticity, stroke victims, Traumatic Brain Injury (TBI), back injuries, spinal cord injuries, migrains, headaches, Cerebral Palsy, and other musculoskeletal manifestations as well as general physiatry. Other techniques or procedures provided are Botox, Dysport, Xeomin, and trigger point injections.